applications including electrical connections for boats, trailers, RV’s, trucks, automobiles, timers, pool electrical, bilge pumps, sprinkler pumps, instruments, computers, circuit boards, switches, and will stop terminal screws from vibrating loose. 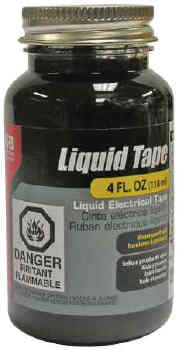 Use Liquid Tape to insulate, protect and color code. movement, heat, or humidity. Always use proper ventilation and protection.